Thank you for visiting LensVillage! Making a purchase at LensVillage is just a fingertip away. Do check out our First Time Buyer to give you a clear idea of what you should know as a first time wearer and of course lens recommendations are available too. Scroll down the step-by-step buying guide to experience effortless checkout process. Have more questions? We are always reachable via email support@lensvillage.com. Shopping at LensVillage is definitely easy. Just follow the steps below. 1. Choose your favourite lens. Our filtering options at left panel allow you to find quickly the lens you want. 2. 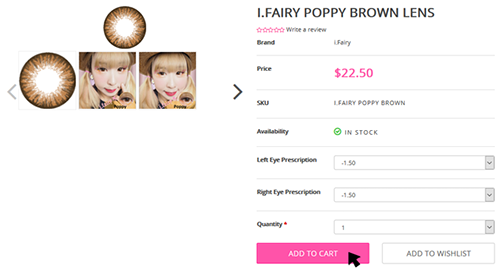 Select your prescription and click on the 'Add to Cart' button. and add it to your basket. 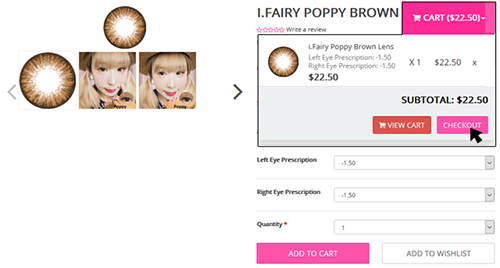 The particular lens will be added to your shopping cart. 3. You can choose to continue shopping or to process order by clicking 'Checkout'. 4. You wil be guided to a Check Out page. Select Sign In if you have registered for an account. By registering an account with us allows you to view your order details and most importantly, delivery update. Insert an active coupon code here too (if applicable). 5. In case you have not registered an account, you are required to fill in neccesary information in the Billing Details & Shipping Details session. 6. Select your preferred shipping method and click 'Continue'. Click here for more shipping information. 7. If you have store credit in your account, you may directly select Store Credit now to pay for your order. 8. Select your preferred payment method. We accept card payment and Europe online banking. Next, click on the 'Proceed to Payment' to make payment. 9. You will be guided to the payment gateway page to complete details. Once completed you will be redirected back to LensVillage. Order confirmation will be sent to your email. We take 2-3 working days to process your order. Tracking number is updated under your order details by signing in your account. Sit back, relax and wait for your package to arrive at your doorstep.